A4 1996-2002, LAMBO DOOR KIT, PAIR. | LOVE YOUR CAR!, BE THE FIRST, BE THE BEST!! 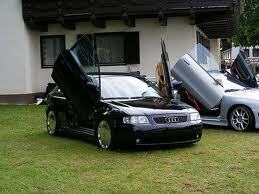 Home / LAMBO, VERTICAL, SCISSOR DOORS / Audi / A4 1996-2002, LAMBO DOOR KIT, PAIR. A4 1996-2002, LAMBO DOOR KIT, PAIR. GT3 LAMBO DOOR KITS ARE MADE TO FIT DIRECTLY TO THE BOLT POINT MOUNTS OF YOUR CAR ACCORDING TO THE SPECIFICATIONS, MEASUREMENTS AND WEIGHT OF THE DOOR OF EACH VEHICLE MAKE AND MODEL. NO GRINDING OR WELDING REQUIRED UNLESS SPECIFIED. Heavy duty, strong built. Fully reversible Direct bolt on, (pair) Front Doors Kit. Doors will still open normal by about 50-60% and 45 degrees vertical. Please see our video in you-tube: http://www.youtube.com/watch?v=7wa3P4yiFz8 Kit comes complete with hardware, shocks and installation manual, professional installation recommended. Wrong fitting or damage will void warranty. Please feel free to contact us on 07-3103 0381 for any questions, Fitting available in Brisbane, Queensland. Direct bolt on Kits available for most Cars available. (Note: some pictures are only for reference), please allow up to 14 days for deliveries. Most Front door GT3 Lambo doors are direct Bolt on Kits, No grinding, No welding required and Fully reversible unless otherwise indicated on the item description, However customer should understand that Lambo door kits are unlike OEM parts and might need modifications, most vehicles have a lip inside the fender where it lines up with the door that most be bended by making a few cuts on the lip in the middle area so there is enough space for the kit to move, this won’t affect the fender strength or shape. Some vehicles have lips or bumps on the body wall that most be flattened so the kit sits flat and straight. This kit is bolt on when indicated according to specifications of the country of each car manufacturer, however in some cases manufacturers change the bolt points of the door hinges with out notice and the kit won’t line up in this situation, cars in different countries might not have the bolt points exactly in the same spot and some modification to the kit will be required to make it fit, , the fitter might need to drill a new holes, extend the existing hole(s) on the KIT to line up with he ones of the car or other modifications, therefore we recommend professional installation, a panel beater with experience in Lambo doors is the best option, Installation and use of these items is the responsibility of the customer; INSTYLE AUTO is not be responsible for any of these situations or customer’s actions. RETURNS AND REFUNDS FOR LAMBO DOORS ARE NOT ACCEPTED. CUSTOMER UNDERSTANDS THE DIFFICULTY OF INSTALLATION OF THESE ITEMS AND ACCEPT BY PURCHASING.